Until 2018, Interstate 95 followed multiple routes through the state of New Jersey. 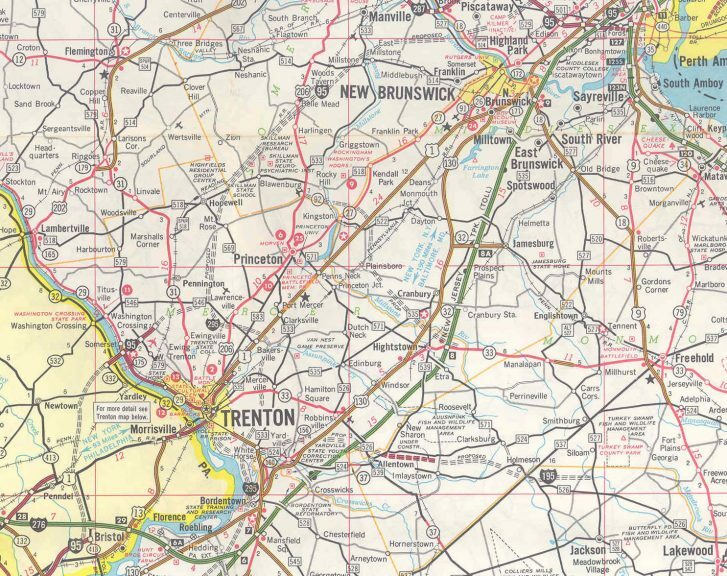 The gap created by the unconstructed Somerset Freeway between Trenton and South Brunswick resulted in a discontinuous I-95, with sections along the Trenton belt line and New Jersey Turnpike, and trailblazers posted along I-295 and I-195 to make the connection between the two highways. Planning for the Interstate 95 through central New Jersey involved several routes between Trenton and South Brunswick. One of the corridors closely paralleled and used portions of U.S. 1 between Trenton and New Brunswick. Later corridors focused on the stretch between U.S. 206 and U.S. 1, from the Trenton belt line northward to Interstate 287. Other proposals included a two-prong freeway connection with Interstate 287, with Interstate 695 forking north to connect with I-287 at Piscataway and I-95 curving east to merge with I-287 at Edison. All of these plans however were canceled, with the Somerset Freeway cancelled formally in 1982.
he projected path for Interstate 95 and the Somerset Freeway in 1969. Plans for the Somerset Freeway were ultimately dropped in 1982. That left Interstate 95 to follow the New Jersey Turnpike from I-287 northward to Interstate 80 and the George Washington Bridge approach at Teaneck. In the 1990s, Interstate 95 signs appeared on the New Jersey Turnpike south of I-287 to the interchange (Exit 7A) with Interstate 195. By 1999, a proposal arose to relocate Interstate 95 onto the Pearl Harbor Memorial Turnpike Extension between Bristol, Pennsylvania and the New Jersey Turnpike near Bordentown. Signs quickly appeared on that stretch as well. Sign installation in 2004 also added Interstate 95 trailblazers to guide motorists on I-295 south from U.S. 1 at Lawrenceville to I-195, and along I-195 east to the exchange with the New Jersey Turnpike (Exit 7A). The relocation of Interstate 95 onto the Pearl Harbor Memorial Turnpike Extension was contingent on completion of a direct connection between I-95 and the Pennsylvania Turnpike (I-276) in Bucks County, Pennsylvania. Following years of delays, work finally commenced on the project in 2009. Two flyover ramps at the I-95/PA Turnpike Interchange opened on September 23, 2018. 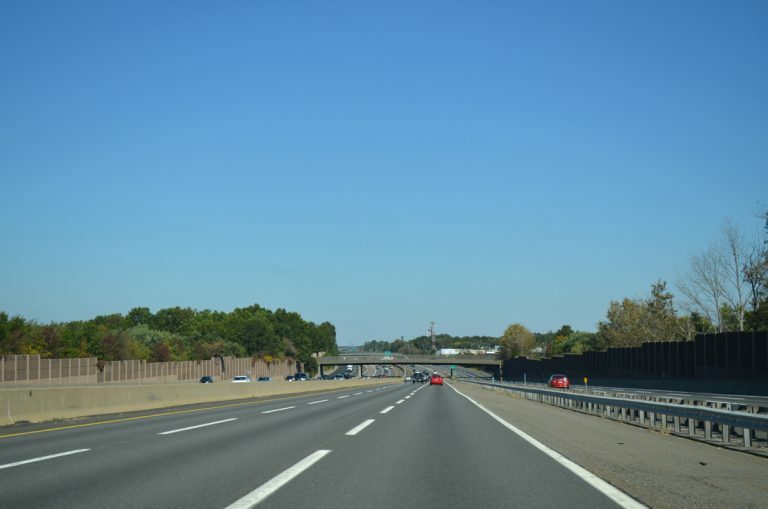 With their completion, the gap in Interstate 95 was filled. Sign changes underway in January 2018 preceded the opening of the I-95/PA Turnpike Interchange. Renumbering included extending Interstate 295 west over what was Interstate 95 along the western half of the Trenton belt line between the Scudder Falls Bridge and U.S. 1 at Lawrenceville. I-95 north of Interstate 276 through Bucks County, Pennsylvania was renumbered as east/west Interstate 295. Interstate 95 along the New Jersey Turnpike, from the Pearl Harbor Memorial Turnpike Extension near Bordentown northward to the Easterly and Westerly Alignments at Kearny, utilizes a dual roadway configuration. The Inner Roadway consists of travel lanes for passenger vehicles only while the Outer Roadway is open to all vehicles including trucks and buses. Photo taken October 5, 2014. I-95 and I-295 trailblazers posted along Bull Run Road eastbound in Ewingville. Bull Run Road connects New Jersey 31 (Pennington Road) with Federal City Road. Federal City Road connects with the Trenton belt line. Photo taken 03/15/00. Interstate 95 trailblazer formerly posted at the Upper Ferry Road intersection with CR 579 (Bear Tavern Road) in Ewing. Photo taken 03/15/00. New Jersey 31 winds north through Ewing township to meet the Trenton belt line at a six-ramp parclo interchange. Photo taken 07/20/05. Departing the New Jersey Turnpike at Exit 7 for U.S. 206 at Bordentown. A pair of trumpet interchanges and a connector road/toll plaza link the two highways. Pictured here is an Interstate 295 guide sign for U.S. 206 southbound at the Bordentown exit. There are no direct connections between Interstate 295 and the New Jersey Turnpike. However traffic destined for I-295 can access the freeway via U.S. 206 south to Rising Sun Lane Road west to the Exit 56 interchange of Interstate 295. Photo taken 03/23/04. Sign bridge posted after the New Jersey Turnpike Exit 7 toll plaza for the U.S. 206 trumpet interchange. The US highway travels eight miles south from Trenton to Bordentown before crossing paths with Interstate 95. South of the tollway, U.S. 206 serves the military installations of Fort Dix and McGuire A.F.B. Photo taken 03/23/04. Gore point overhead at the U.S. 206 ramp partition from Interstate 95 & New Jersey Turnpike Exit 7. U.S. 206 comprises a four-lane surface arterial between the Mt. Holly and Mansfield communities northward to South Broad Street at White Horse. An Interstate 295 trailblazer points to U.S. 206 southbound. One mile separates the trumpet interchange from the Exit 56 half diamond interchange on Rising Sun Road. Photo taken 03/23/04. Degraw Avenue westbound approaching the parclo cloverleaf interchange with Interstate 95 at Overpeck County Park. I-95 meets the eastern terminus of I-80 just west of the Degraw Avenue exit. Photo taken 03/15/00.